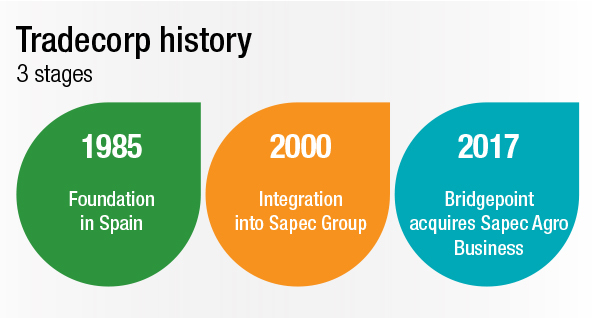 In the year 2000, Tradecorp became a part of the Sapec group, a family company established in 1926 in the chemical and mining sector. Tradecorp’s incorporation into the group gave it an even broader perspective, given the combination of the group’s entrepreneurial spirit and our experience and know-how in the agricultural sector. The increase in investment that followed acquisition by the Sapec group marked a new stage in our development, since we reinforced our position in the market and we enjoyed a considerable expansion at an international level. This expansion brought with it a significant increase in sales, which grew by an average of 30% per annum. Service and proximity to the market are key elements of the company’s strategy. The Group is present around the world with affiliates, offices, plants and above all its experienced staff adapted to local markets. Sapec Agrobusiness continues today boosting innovation and service in crop nutrition and crop protection with the full backing of Bridgepoint. 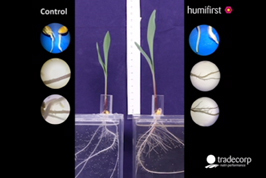 Watch the benefits of Humifirst in root development! Timelapse video showing the benefits of Humifirst / Humistar in root development.